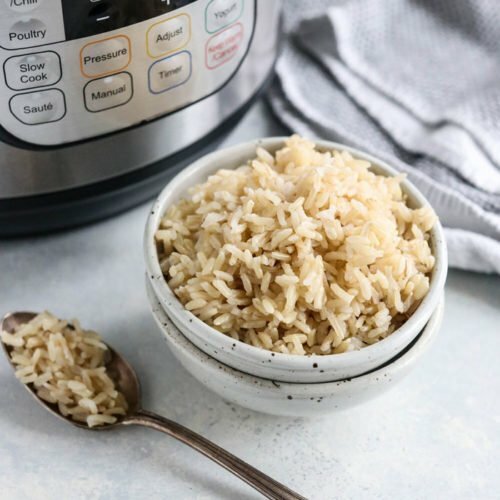 This INSTANT POT BROWN RICE is fluffy and perfect every time! You can use this step-by-step recipe for cooking any variety of rice, but the timing will be different depending on which one you use. Combine the rice and water in the bottom of the Instant Pot and give it a stir. Secure the lid and move the steam release valve to Sealing. Press the Manual or Pressure Cook button and cook at high pressure for 22 minutes. The pot will take roughly 8 minutes to come to pressure before the cooking cycle begins. When the cooking cycle is complete, allow the pressure to release naturally for 10 minutes. (In other words, don't do anything right away.) When the screen reads LO:10, move the steam release valve to Venting to release any remaining pressure. When the floating valve in the lid drops, it's safe to remove the lid. Fluff the rice with a fork, and serve warm. Leftover rice can be stored in an airtight container in the fridge for up to 5 days.